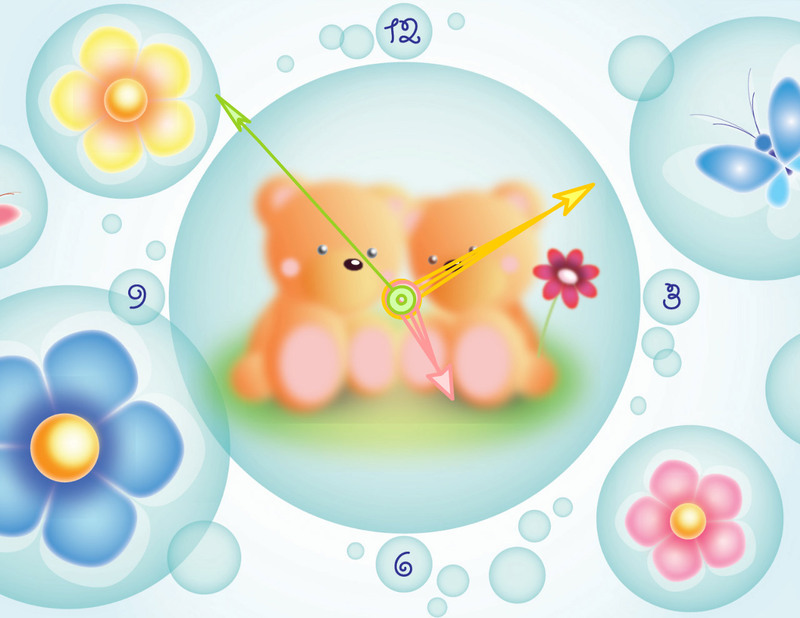 Teddy Bears Clock Screensaver will let you have a joyful mood all the time! Teddy Bears Clock Screensaver is designed to fill your heart with positive emotions. It introduces the character well-known from your childhood - a friendly and soft Teddy Bear with a cute look on his face. Teddy Bear represents the love and care for the people of all ages. Both children and adults will be pleased to get such a token of your attention. The screensaver is so versatile that it can show love of parents and children, care for your friends and affection to the person with whom you have relationships. It'll be a fine present for you and your beloved ones. When the screensaver is on, your desktop gets filled with many bubbles of various sizes. Within these bubbles you may see vivid flower buds and butterflies. The central bubble shows two cute little Teddy Bears sitting on a grass and holding a blossoming bloom. Teddy Bears serve as a background to the fancy looking clock. Clock hands of different colors and curved digits make the design really classy. With the screensaver like that, you will always have a joyful mood. Teddy Bears Clock Screensaver is a reminder to the fact that whatever happens, there are always people that care for you and willing to share their love with you. Fill your heart with positive emotions!